“It’s a wonderful group ... more than a community band; it’s a semi-professional band. They play that well.” Colonel Arnald D. Gabriel (ret. ), Conductor Emeritus of the U.S. Air Force Band said of our flagship ensemble. 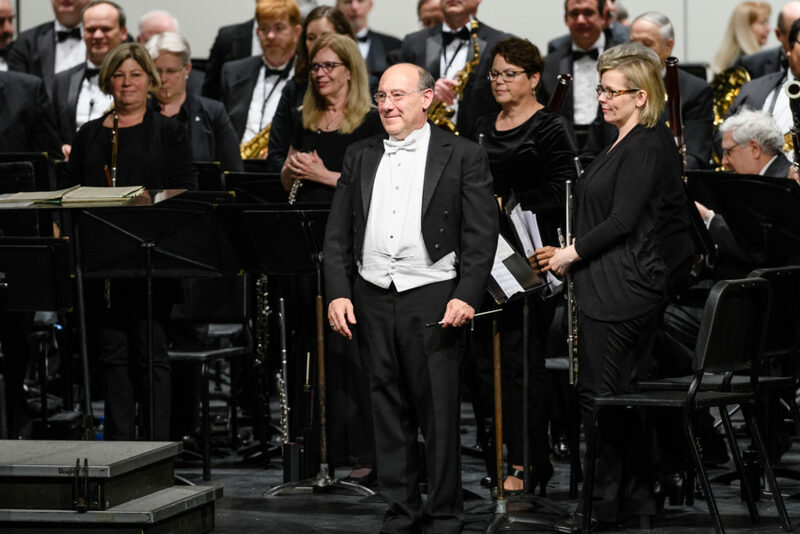 Formed in 1969 as a small, summer-season group, the band has grown into one of Northern Virginia's best-known community music ensembles, among a small number of the Nation's community bands to achieve high standards. Its talented musicians are accomplished amateur players, including local music teachers, former members of the nation’s top Washington-based military bands, many with music degrees, from the business, tech, education, and government sectors who enjoy sharing their time with the Fairfax community. Conductor Robert Pouliot is the 2018 winner of the Outstanding Conductor Award from the Association of Concert Bands, a national honor recognizing conductors who have demonstrated musical leadership excellence, conducting skills, musicality, community contributions, educational foresight, and dedication to the organization.​ In recognition of its high musical standards and achievements over the years, the band was awarded the Sudler Silver Scroll from The John Philip Sousa Foundation in 2004, one of North America's most prestigious awards for community concert bands. In 1981, the Commonwealth of Virginia honored the band when then-Governor John N. Dalton selected it to perform at the Yorktown Bicentennial Celebration’s opening ceremonies. During its 45th anniversary season, Governor Terry McAuliffe proclaimed November 1, 2014 as The City of Fairfax Band day. Association of Concert Bands convention in Allentown, PA. The City of Fairfax Band has no openings at this time except for alternates and substitutes, but we hope you will keep us in mind for the future!